Style #T3425P - For elegantly styled sleepwear that also wicks away moisture, this new embossed print women's moisture-wicking sleepwear set from Cool-jams™ is the perfect choice. 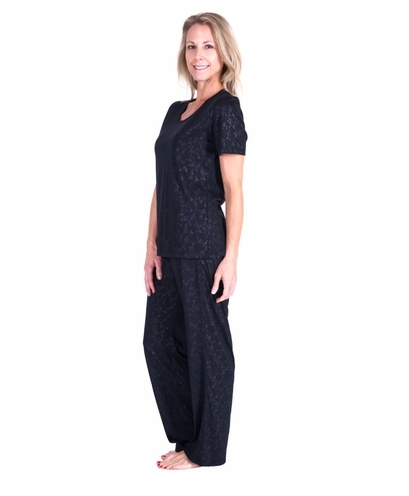 This sweat wicking pajama set features a scoop neck top with matching bottoms made using our unique Cool-jams™ smart fabric technology that is scientifically woven into each fiber of the soft, silky fabric, creating a comfortable fit that also wicks away moisture from the skin. Not only is this women's moisture-wicking sleepwear set a great option for those struggling with night sweats, it is also lightweight and wrinkle-resistant so that you can easily bring it with you while traveling. Stay cool and dry while at home or on the road with this comfy and cool cooling PJs set. Pant inseam length 30". Women's moisture-wicking sleepwear set weight approximately 11 oz. Wash your cooling PJs set in cool or warm water on gentle cycle. Never use fabric softener or fabric softener sheets because it will minimize the wicking properties of the fabric. If you accidentally use fabric softeners, re-wash the women's moisture-wicking sleepwear set in clear water to remove softener residue, so the wicking properties will return to maximum effectiveness. Lay your cooling PJs set flat or hang to dry. Tumble drying won't damage the women's moisture-wicking sleepwear set, but can sometimes create static. I live in AZ but ordered this item before going to San Francisco for vacation. Fabric is soft, very comfortable and modest. Liked this item so much, I ordered a second set. I usually wear gowns but may switch to pajama sets from now on. Bought these for an upcoming trip. I think they will be great for travel since they are light-weight and pack very small. They are very comfortable to sleep in, but the fit (in a 2X) is odd. The top is slightly on the small side, but the waist on the bottoms is way big... to the point that I am going to have to stitch in a piece of elastic to help them stay up. The sizing is just not your traditional 2X sizing. I could live in these pajamas 24/7! They are incredibly comfortable, very attractive, and lightweight -- perfect for my carry-on-only travels, as well as everyday (night) use. The new embossed prints that you do are awesome. They are subtle and sophisticated. Keep up the great design work. I only sleep in Cool-jams and have been waiting for nice prints for awhile.